Find out what stage 3 breast cancer is and about treatment options. 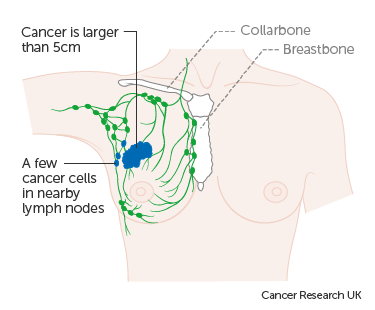 Stage 3 means that the cancer has spread from the breast to lymph nodes close to the breast or to the skin of the breast or to the chest wall. It is also called locally advanced breast cancer. Stage 3 breast cancer is divided into 3 groups. 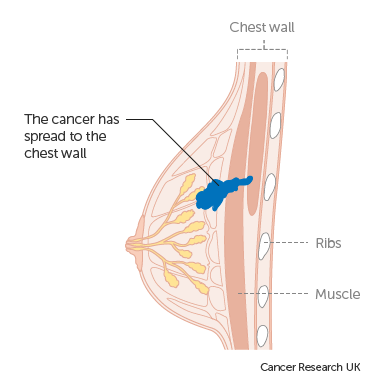 Stage 3B means the tumour has spread to the skin of the breast or the chest wall. The chest wall means the structures surrounding and protecting the lungs, such as the ribs, muscles, skin or connective tissues. The cancer has made the skin break down (an ulcer) or caused swelling. 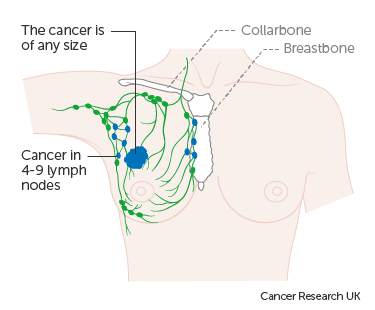 The cancer may have spread to up to 9 lymph nodes in the armpit or to the lymph nodes near the breastbone. 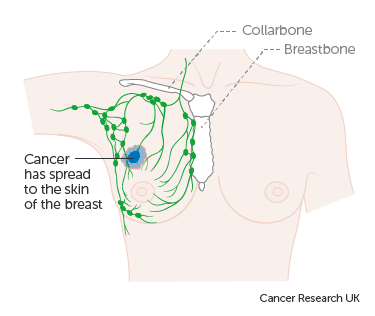 Cancer that has spread to the skin of the breast might be an inflammatory breast cancer. For treatment, doctors divide stage 3C breast cancer into cancers that can be operated on (operable breast cancers) and those that can't (inoperable cancer). The TNM staging system stands for Tumour, Node, Metastasis. You might have drug treatments such as chemotherapy or a targeted cancer drug as a first treatment. This is followed by surgery and then more drug treatments. Or you might have surgery as a first treatment followed by chemotherapy or other drug treatments. You might have chemotherapy as a first treatment to shrink the cancer down. If your cancer cells have particular proteins called HER2 receptors you might also have a targeted cancer drug called trastuzumab (Herceptin). These treatments might shrink the tumour enough to allow your surgeon to remove just the area of cancer. This is called a wide local excision or lumpectomy. If the cancer doesn’t shrink enough, you need to have the whole breast removed. This is called a mastectomy. 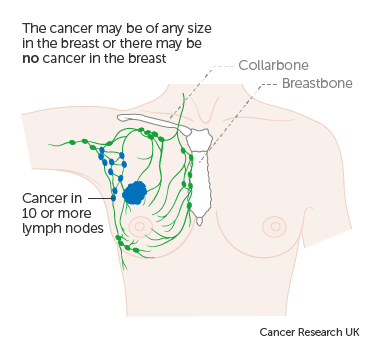 Your surgeon will also remove lymph nodes from under the arm to check for cancer cells. 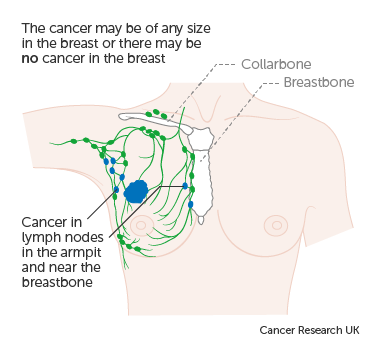 You usually have radiotherapy to the breast after surgery. If you have a new breast shape made (breast reconstruction) you usually have it after the radiotherapy has finished. You might also have hormone therapy if your cancer cells have hormone receptors. Or you might have more chemotherapy. You usually have the whole breast removed (a mastectomy). 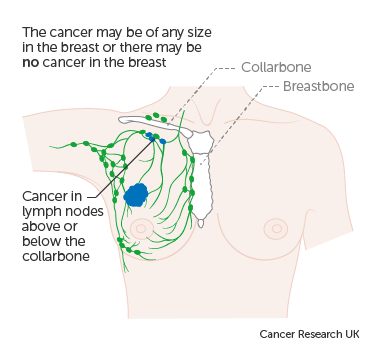 Your surgeon will also remove some of the lymph nodes under the arm to check them for cancer cells. After the surgery you have radiotherapy to the breast. You might then have surgery to create a new breast shape (breast reconstruction). You might have treatment with chemotherapy for a few months. If your cancer cells have receptors for a protein called HER2 you might have a targeted cancer drug called trastuzumab (Herceptin) as well as chemotherapy. You have this for a year. If your cancer cells have hormone receptors you might then have hormone therapy for at least 5 years. 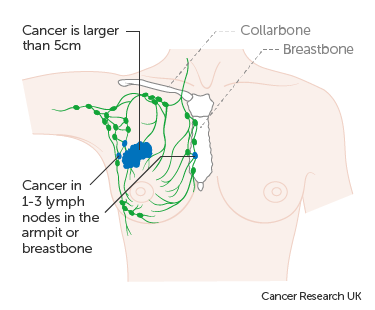 Some stage 3 cancers are a type called inflammatory breast cancers. The treatment is slightly different than for other stage 3 breast cancers.